Grand. Indulgent. Windswept chiffon saris. Saturated candy colour. Hundreds of lovely adjectives can describe Yash Chopra's films. Bollywood specialist Beth Watkins attempts a few. In some ways, Yash Chopra was one of the frothiest of filmi directors, brand-name famous for imagery of the heartaches of the genteel, or the wincingly sensitive artists, punctuated by romantic music and windswept chiffon saris on hilltops. His films are beautiful, perhaps not innovatively so, but in ways that clearly resonated with audiences for decades. They are grand, across fields and mountains; indulgent, demanding of the big screen to drink them in, yet also soft and cozy. 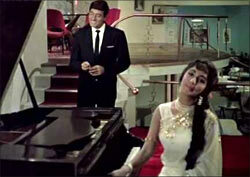 Saturated candy colours, twinkling lights, and flowering gardens are prominent as far back as Waqt (1965). The brooding and longing of Kabhi Kabhie (1976) is sprinkled with poetry, rain, and flowers. The despair of selfishness and bad decisions in Silsila (1981) is decked in blooms and soulful gazes. There is a quietness to his portrayals of the wealthy, who are elegant and eloquent, never brash and tacky. They are noble, making sacrifices and quietly swallowing their pain, out of love for other people. Their lives are casually accessorised by trendy, patterned fabrics, horse riding, and, of course, trips to Switzerland. Who wouldn't want to live in their world? But Chopra was also a genius with the darker, more secret sides of the human experience: jealousy, exclusion, loneliness, shame, regret, and loss. He was so talented at handling the dangerous and frightening aspects of human nature that Darr (1993) transformed a villain into the hero, at a superstar scale, that has barely diminished 20 years later. Like his great director in that film, Shah Rukh Khan is best known for love stories. But in Darr, Chopra clearly knew exactly what he was doing by letting SRK scare the wits out of us. Darr also embodies one of Chopra's greatest appeals to people like me, who prefer his earlier films to his later work: even when the stories he chooses to tell are unappealing (the plots of Chandni and Lamhe are so maddening I'll never watch them again), the films he develops around them are rich with gifts to the viewers, especially in visual and musical beauty. And his actors! He worked with the best and got the best out of them. Fingers crossed that holds true for the usually cardboard and outclassed Katrina Kaif in his upcoming Jab Tak Hai Jaan. He knew how to structure and develop a film. He crafted complete works, not sloppy sort-ofs. Chopra has been credited with expressing the deep pain of Partition in his films, and his second film as a director, Dharmputra (1961), condemns extremism that threatens the stability of both the nation and the family. Like Waqt, it is also a magnificent example of early iterations of story elements that make up the classic masala formula of lost and found family members, brotherhood, social barriers, identity, irony, and not-so-subtle symbolism. While not one of my favourite films, despite being the most famous performance by my favourite actor, Shashi Kapoor, Deewar is undeniably powerful. Every time I watch it, the tragedy of the brothers and their deeply flawed mother brings fresh pain and frustration. It too shows evidence of the director's gift for using actors to great impact. In their second outing as co-stars (the first time being Manoj Kumar's Roti Kapada Aur Makaan), Shashi Kapoor and Amitabh Bachchan are as convincing as agonised antagonists, as they are in many later productions as a brotherly pair; Chopra himself paired them four more times in different iterations of conflict and affection. And Nirupa Roy may have the face of 'everybody's favourite Maa' but acts like a monster, manipulative and dangerous. In Deewar, wealth and duty are not a comfortable background but constantly pricking reminders of the true goal -- love -- that can be neither counted nor achieved. The heart of film that I nominate as Yash Chopra's masterpiece, Kaala Patthar (1979), is buried in the menacing, eradicating depths of a coal mine. Built around a flawless Salim-Javed script, this film balances selfishness with courage, sorrow with hope, isolation with community. It has important things to say about big issues and ideas (industry, labour, the environment, reform of one's character) while never letting go of the simple satisfaction of perfectly-matched romances. It is fearful and sweaty, yet it brings kindred spirits together, rekindles friendships, and quietly respects love. Under Yashji's guidance, actors carefully, even lovingly, sketch a dozen characters, who make sense and behave like actual people rather than broad character types. It is pitch-perfect at every turn, shafts of light penetrating the darkness at just the right moment. Kaala Patthar is as far from chiffon saris as you can get. And it is absolutely unforgettable. Jab Tak Hai Jaan to be banned in Pakistan?